that our father leaves open. From mountain pass to storm-tossed seashore, from Barcelona to the Drakensberg, these new poems by Adam Wyeth feature journeys both witty and surreal. There is much that is busy transforming here, from kitchen to ice-rink; rock to hatching egg. In the richly imagined Talking Tree Alphabet, a birch tree becomes Marilyn Monroe holding down her skirt, while the blackthorn is a ‘ravaged whore’. At the heart of the collection, the still point around which the energies flow, is a boy’s relationship with his father, the absurd indignity of death, and the ceaseless unfolding of the generations: ‘An ancient vellum/ where the next life is written’. Language, the raw material of the poet who shapes and makes sense of the world, is celebrated without forgetting the humble source of it all, Yeats’s foul rag and bone shop, or ‘thorns/that draw blood and score the heart completely’ (from ‘Gorse’). Dancing on the edge of civilization, preferring the energizing potential of dream and myth, Wyeth’s is a refreshing new voice on the Irish poetry scene. Adam Wyeth lives in Dublin. His critically acclaimed collection, Silent Music, was Highly Commended by the Forward Poetry Prize. His poetry has won and been commended in many international competitions, including The Bridport Poetry Prize, The Arvon Poetry Prize and The Ballymaloe Poetry Prize. His work appears in several anthologies including The Forward Prize Anthology (2012 Faber), The Best of Irish Poetry (Southword 2010) and The Arvon 25th Anniversary Anthology. In 2016, he was selected as a Poetry Ireland Review Rising Generation poet. Adam’s second book The Hidden World of Poetry: Unravelling Celtic Mythology in Contemporary Irish Poetry was published by Salmon in 2013. The book contains poems from Ireland’s leading poets followed by sharp essays that unpack each poem and explore its Celtic mythological references. Adam has also had several plays produced in Ireland and Germany including Hang Up, produced by Broken Crow (2013), which was adapted into a film in 2014 and premiered at Cork’s International Film Festival. It was also staged in 2015 in Berlin as part of ‘An Evening of Adam Wyeth’ at Theaterforum Kreuzberg. Adam runs online Creative Writing workshops and editing programmes at adamwyeth.com and Fishpublishing.com. that contained the address of her final destination. that sparked a trail before going out. disappearing among the throng on La Rambla. taking long draws on her cigarette. a magazine, toothbrush, tampons, dirty underwear. a diamond ring, a signed copy of Ulysses, first edition. ‘Should I call the police?’ I asked, sitting back down. She gave a shrug that showed the futility of my question. like ravens scrapping over road kill. snatched like a loose thought tossed to one side. the velvet-curtained sky, a satellite spun out of orbit. of glass – but knew if I did the world would shatter. leaving it off the latch. The leaves are still falling. of leaves patting the pane. Like a child’s magnifying glass, the eyes of Dublin poet Adam Wyeth brim the world over with rich detail in this adventurous collection of poems. 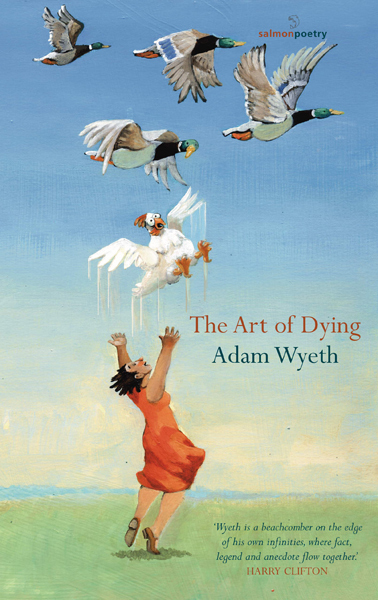 The wide-roaming scenes that the reader rushes through in The Art of Dying find humour in surprising places and profundity in the simplest, imbuing the natural, the exotic, and the domestic with equal measures of myth.